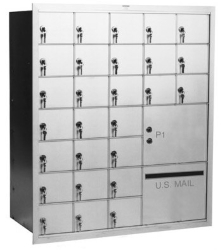 U.S. Mail Supply boasts a vast inventory of commercial and residential locking mailboxes for businesses, municipal buildings and residential homes throughout California and the United States. 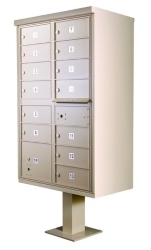 Whether you’re looking for outdoor cluster mailboxes with a vintage style finish or indoor horizontal lockable mailboxes for maximum security, we’ve got the solution for you. Shop commercial mailboxes for sale online from U.S. Mail Supply – big and small outdoor pedestal mailboxes, high-end mail boxes for luxury apartment buildings, or simple indoor wall mounted horizontal mailboxes for small businesses. Whatever you need, we likely have it. 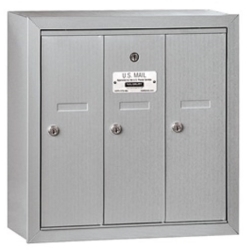 We offer USPS approved 4C horizontal mailboxes and 4C pedestal mailboxes for private delivery. With numerous tenant door options, we’ve got the perfect mailbox for your apartment complex, hospital, military base, government building or any other multi-unit facility. Buy mailboxes with USPS approval – meaning they already meet USPS regulations for mail delivery. Installation is easy, and customization options are available for package slots and outgoing mail slots. 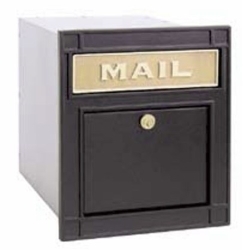 Shop outdoor pedestal mount mailboxes for apartments. We have elegant Victorian style decorative mailboxes for luxury complexes and basic modern Vital™ F Series cluster mailboxes. U.S. Mail Supply offers USPS approved and private use outdoor pedestal mailboxes in a variety of styles – decorative, standard 4C pedestal mailboxes and large locking residential mailboxes with options for post additions. Indoor mailboxes for sale online from U.S. Mail Supply include front and rear loading, horizontal and vertical mailboxes with surface mount or recess wall mount capability. Shop durable metal mailboxes for residential housing, including wall mounted mailboxes and pedestal mounted locking mailboxes with decorative posts. Get organized! 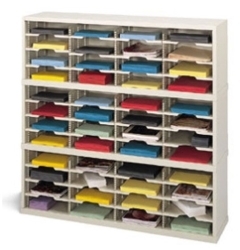 Buy mail sorters and literature organizers from U.S. Mail Supply. Great for mailrooms, classrooms, and any business that deals with papers and brochures. U.S. Mail has residential mailboxes in stock to meet the needs of any contemporary Californian lifestyle. Our residential mailbox product line includes wall-mounted, post-mounted, and column mounted mailboxes that come in an assortment of decorative colors and finishes. 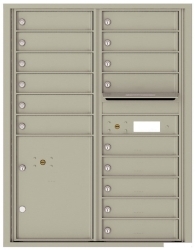 All of U.S. Mail’s residential mailboxes feature locking capabilities to help insure your property’s security. With longevity always being pinnacle to any home improvement purchase, you can depend on our mailboxes for years. Pay for quality now to avoid paying for a replacement later. U.S. Mail Supply's residential mailboxes are made to fit your home’s style and are built to last. As one of the premier suppliers of mail and shipping room supplies and equipment in California, U.S. Mail offers dependable mail sorters for your personal or business mail organization. From a kindergarten classroom, to a hedge fund office, to a skyscraper’s mailroom; our mail sorters are built to handle it all with security options to guarantee your materials' safety. Constructed of high quality steel and effectively welded, U.S. Mail’s mail sorters are made to last through any test. The adjustable shelves on our mail sorters can be moved to fit a vast range of mail and personal items, and come in a variety of sizes and shapes from the heavy duty 120” mail sorter to the economical 25” mail sorter. US Mail Supply offers numerous options from open back steel mail sorters and vertical mail sorters to steel security mail sorters, ensuring we have the solution best suited to your needs. Skip the cheap options and purchase a mailbox that gives you peace of mind. 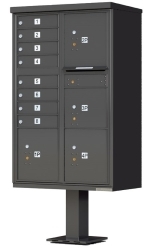 Our pedestal, surface mounted and wall mount mailboxes are constructed of heavy duty steel and aluminum, guaranteed to stand up to extended use and harsh climates. Security features such as 3-digit combination locks keep your property secure. 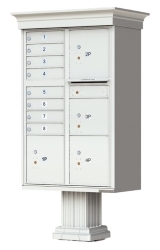 Our USPS approved lockable outdoor pedestal mount mailboxes stand up to the elements and year of hard use. There’s no use in saving a few bucks today on a cheap mailbox only to find yourself back out shopping for a replacement when it breaks in a couple years. Metal mailboxes from U.S. Mail Supply are a long-term solution to bring you peace of mind for years to come. Fill out the form with your desired dimensions, number of slots, loading type, and give us some information about how you’ll be using your mailbox. We'll get back to you with an illustration of how your new mailboxes will look and a quote on your best options.